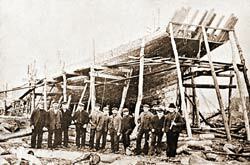 There is no accurate record of shipbuilding at Porthdinllaen before 1776 when the Registers of Shipping started, although many small vessels were built there, but in the next century 1776 to 1876, records show that fifty seven ships were built. In the earlier years most of them were small sloops but a brigantine “Maria” was 95 tons, and built in 1786. Schooners and the occasional brigantine replaced sloops as the size of ships increased. The average size being ninety tons, but varying between the little sloop “Lively” 16 tons built in 1790 and the barque “Robert Jones” 287 tons built in 1866. 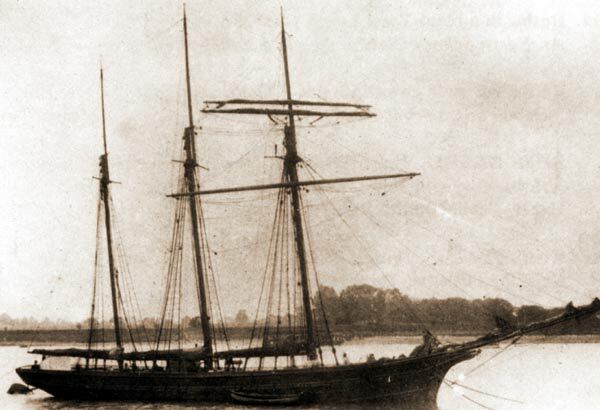 The last vessel built there was the brigantine “Annie Lloyd” 149 tons in 1876, which was lost in the Bahamas in 1907. Cr/Cutter, Sp/Sloop, Sr/Schooner, Sr 3/Three masted Schooner, Bc/barcque, Bg/Brig, Bgn/Brigantine. 1776 Phoenix Sp 27 Lost. 1784 Brothers Sp 62 Lost off Aberdeen, 1797. 1786 Maria Bgn 95 Sold to Lancaster, 1853. 1787 Nancy Sp 22 Sold to Aberteifi, 1801. 1788 Active Sp 74 Sold to Aberteifi, 1795. 1790 Lively Sp 16 Broken up. 1791 Molly Sp 21 Lost, 1844. 1796 Sidney Sp 47 Lost, 1803. 1798 Speedwell Sp 37 Lost, 1808. 1814 Venedotia Sp 65 Lost. 1826 Margery Bg 101 Owen Jones Lost at Sea. 1841 Commerce Sp 21 Evan Ellis Broken up 1888. 1841 Maria Cathrine Sr 119 Rob Griffith Lost, Goodwin Sands 30-1-1886. 1841 Margaret Ann Sr 111 William Jones Lost off Fraserburg 1866. 1842 Lady Ellen Sr 100 Thomas Williams Lost at sea 1861. 1845 Three Brothers Sr 98 John Roberts Lost, North Sea 1880. 1846 Eliza Ellen Sr 54 Hugh Hughes Lost, 1858. 1848 Prosper Sr 130 John Roberts Lost off Lowestoft January 1883. 1848 Martha Sr 50 Richard Jones Lost at Pistyll 27-9-1875. 1849 John Evans Sr 52 Sold to Fleetwood 1855. 1849 Elizabeth & Margaret Sr 63 Hugh Hughes Lost off Flamborough Head 20-10-1874. 1850 Catherine & Alice Bgn 98 Evan Ellis Sold to Weymouth 1885. 1851 Luther Sr 77 Evan Ellis Collided with steamer river Mersey 4-2-1870. 1852 Maria & Ellen Sr 107 Hugh Hughes Lost off Thurso 5-8-1880. 1852 Ellen Hughes Sr 99 Hugh Hughes Lost Milford Haven 1868. 1854 Collina Sr 58 Hugh Hughes Lost, 8-3-1869. 1855 Richard Roberts Sr 85 Lost at Fishguard 1969. 1856 Eleanor & Jane Sr 89 Hugh Hughes Lost Loch Broome 29-11-1887. 1857 Miss Beck Sr 120 Robert Thomas Hulk at Liverpool in 1914. 1857 Maria & Jane Sr 99 James Owen Lost off Clare Ireland 27-12-1898. 1857 Hope Sr 56 Lost, 1877. 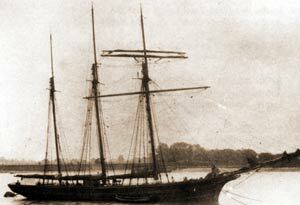 1858 Ann & Ellen Sr 110 Hugh Hughes Sold to Porthdinorwic 1883, hulk 1895. 1858 Mary Rowlands Sr 130 Hugh Hughes Lost with all hands 1904. 1859 Moses Parry Sr 81 Evan Ellis Sold to Dublin 1902. 1859 Revival Sr 96 Hugh Hughes Broken up 1916. 1860 Hugh & Ann Sr 93 James Owen Lost near Liverpool 14-1-1895. 1861 Jane Hughes Sr 99 Hugh Hughes Lost at Loch Eribold 18-3-1881. 1861 Voelas Sr 79 Hugh Hughes Lost off Bardsey 1869. 1862 Frances Anne Sr 99 James Owen Lost Browershaven 1873. 1863 Grace Phillips Sr 86 Evan Ellis Lost off Holyhead 1898. 1864 Fanny Beck Bgn 153 James Owen Lost with all hands, Patagonia 1879. 1864 Ellen Williams Sr 70 Sold to Ardrossan 1878. 1864 Robert Williams Sr 64 Evan Ellis Lost river Severn 1883. 1865 Nuggett Sr 73 Griffith Owen Sold to Bideford 1888. 1865 Mariner Sr 70 Evan Ellis Lost off Anglesey 1894. 1866 Robert Jones Bc 287 James Owen Lost at sea 7-1-1882. 1866 Catherine Eliza Sr 76 Lost at sea 15-11-1875. 1867 John Davies Sr 90 Evan Ellis Lost, Roche's Point 1878. 1868 Comer Sr 106 Griffith Owen Lost, 9-1-1887. 1868 Elizabeth Griffith Sr 113 William Jones Lost, Busker Rock 6-10-1876. 1870 Ann Alice Sr 97 Hugh Hughes Lost off Linas, 11-3-1877. 1870 Miss Pritchard Sr 92 Evan Ellis Lost, Scotland 3-8-1904. 1873 Sybil Wynn Bg 186 Richard Griffith Lost, 24-2-1884. 1875 Miss Wandless Sr 92 Hugh Hughes Lost, Denmark 14-3-1886. 1876 Annie Lloyd Bgn 149 Hugh Hughes Lost off the Bahamas 6-3-1907. Porthdinllaen built vessels in more detail.